I’m the grill-master in my family; my husband and kids know that the 8 feet of footage surrounding the Weber charcoal kettle and Jenn-Air gas are mine; no trespassing. That hasn’t dissuaded me from suggesting to my husband, Richard, that perhaps he’d like a Big Green Egg (an egg-shaped barbecue smoker) for Father’s Day. After all, I’ve been coveting one for years. I select a more malty beer to marinate my brisket – it’s a personal preference. Use whatever leftover spices you have to make a Southwest-styled rub pleasing to your palate. Actually, no, he replied. Sunday is about me, not you. Would you like a vacuum cleaner on Mother’s Day? His point (for once) is well-taken. One shouldn’t assume that every man’s genetic make-up includes a barbecue gene; some men equate barbecuing with hard labor – even if most Father’s Day ads feature he-men grinning merrily over the flame, dry rub in one hand, sauce mop in the other. But Richard applauds my suggestion of inviting family over for smoked brisket tacos, as long as I do the cooking. A brisket is a delicious, but tough, cut of meat that requires low heat and a long cooking time to tenderize; an ideal candidate for smoking. Mariam, a butcher at Sparrow Meats, made sure the brisket I purchased from them had a 1/4-inch fat cap, which she says is perfect for basting and adding flavor to the beef as it cooks. Another secret to smoked brisket bliss is in the type of wood chips used, which influences the flavor of the beef. Therein lies the problem: I’ve been happily smoking foods on the same Weber kettle for over 20 years, but last month I noticed the bottom’s rusted out—there are holes in it, so smoking won’t be in the picture. Experience has taught me that my gas grill smoke box doesn’t emit enough smoke to season heftier pieces of meat, such as pork butts and beef briskets, so I may as well bake the brisket in the oven. But I’ll finish it on the Jenn-Air since the onions, peppers and tortillas are best grilled, even if over a gas flame. The time for baking, braising or barbecuing uncured brisket is the subject of much debate on grilling forums, which I encourage you to Google. My recipe is not the Holy Grail, by any means, but it yielded some mighty fine tacos that were inhaled in a nano-second. I did, however, miss the smoky flavor in the meat. Pour beer into into a gallon-sized sealable plastic bag, or dish large enough to accommodate meat. Stir in garlic and place beef, meaty side down, into marinade. Marinate at least 12 hours and up to 24 hours refrigerated. 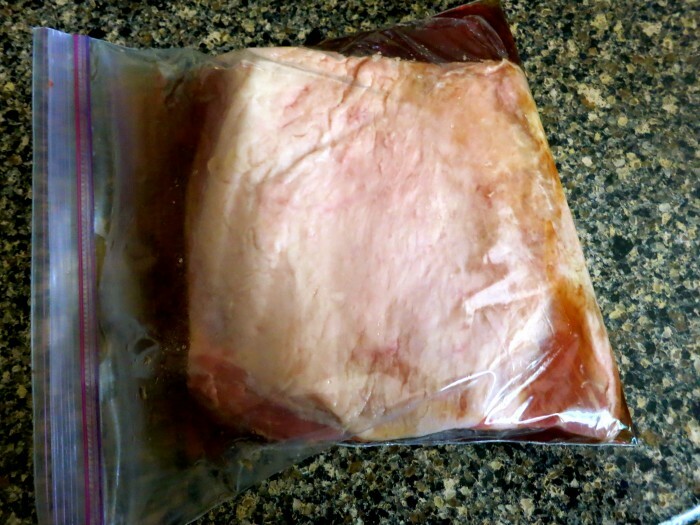 Remove brisket from marinade, do NOT discard marinade. Make a rub by combining salt, 1 tablespoon of the sugar and dry rub. Score fatty side of brisket with a cross-hatch, 1/8-inch deep, then liberally rub mixture all over meat. Allow meat to come to room temperature. Preheat oven to 250 degrees. Bake, uncovered, fat side up, on roasting rack on center rack of oven 3 hours. While meat is cooking, add remaining sugar to the reserved beer marinade mixture. Reduce in saucepan, skimming scum from top, until slightly syrupy; until mixture is about 1/3 cup. Remove meat from oven, baste top with mixture, turn beef over, baste again, cover or enclose top with foil and return to oven for an additional 1 1/2 hours. Prepare grill to low heat. Remove brisket from oven, place on grill. While brisket is grilling, place onion slices and whole peppers on grill. Grill onions alongside beef until tender. If possible, raise heat over poblanos to high and grill until charred on all sides. Place peppers in a paper or plastic bag. When cool enough to handle, remove top and seeds, and pull off charred skin with your fingers. Cut into slices. Grill beef until internal temperature reaches 197 degrees, then remove from heat, wrap in foil and let rest 15 minutes before slicing into strips against the grain. 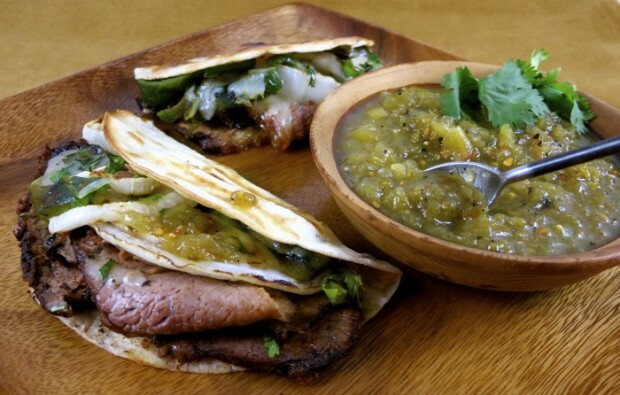 Before serving, place the tortillas on the grill and sprinkle with cheese. When the cheese has just begun to melt, stuff with sliced brisket, onions and peppers, fold over to make a taco and serve with salsa. 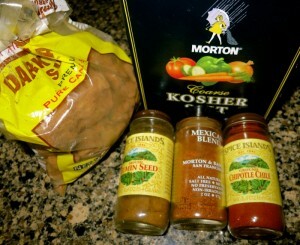 *I used a teaspoon each of ground cumin, chipotle chili powder and a good, but generic, Mexican seasoning blend. Brisket Cooking Time: Until the beef has reached 197 degrees (4 1/2 to 7 hours).